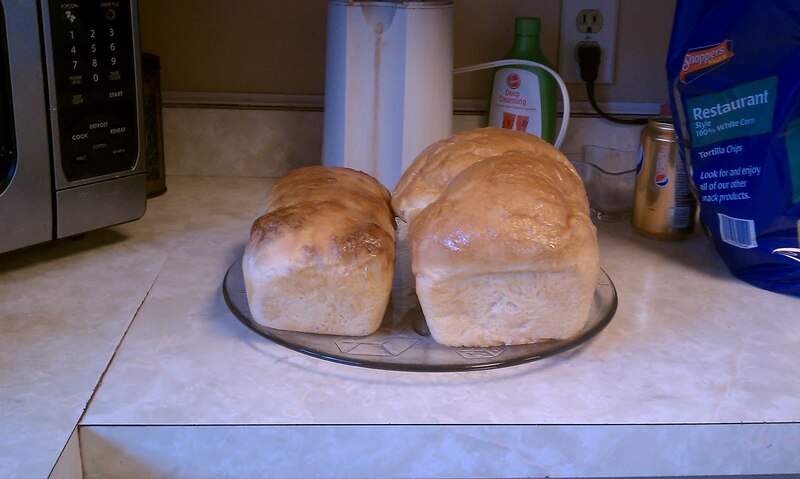 Daddy Chaos made bread. When I say made bread, I mean took frozen dough out of the freezer (because where else would something frozen be, duh)... sprayed the bread pans.. placed said frozen dough into bread pans & placed in fridge overnite to dethaw.. He then baked it.. Daddy Chaos has done this many times before with never quite the above results*.. It looks like a Daddy & baby loaf of bread.. What the heck?? It's just odd, that's all I'm saying.. completely for the record- Daddy Chaos is a wonderful cook & has never had the misfortune to make such odd looking pairs of bread before. For Mother's Day, I was soo nice.. I called my Momma up , told her my uterus was completely trying to kill me and on top of that I had this stupid cold in which I coughed so hard that I not only vomited & saw stars.. but I also got a bloody nose- all from one cough. I kid you not. Once she recovered from that story telling - OMG, what if you had been driving, that cough does not sound very safe, how can you almost pass out from a cough?- I totally played on her sympathies & rather than get her something (because dude, I totally let her have her pick of my Vera Stash) I begged her to make me some homemade noodles.. It worked.. She made me noodles- which I then cooked & promised leftovers (I'm not that bad of a daughter, I would have had her over for supper but hello I'm sick.. We tend to try to keep cooties away from Dad). So Daddy's breads- although looking mighty funny, tasted great with my Mother's Day dinner. *Silly man thought I'd come on here, make fun of his loafs & then just leave him hanging like a guy who just can't cook. He can totally cook- he just likes to hide the fact so I dont make him do it more often!